EFFORT: Easy for technical difficulty, Medium for Endurance. 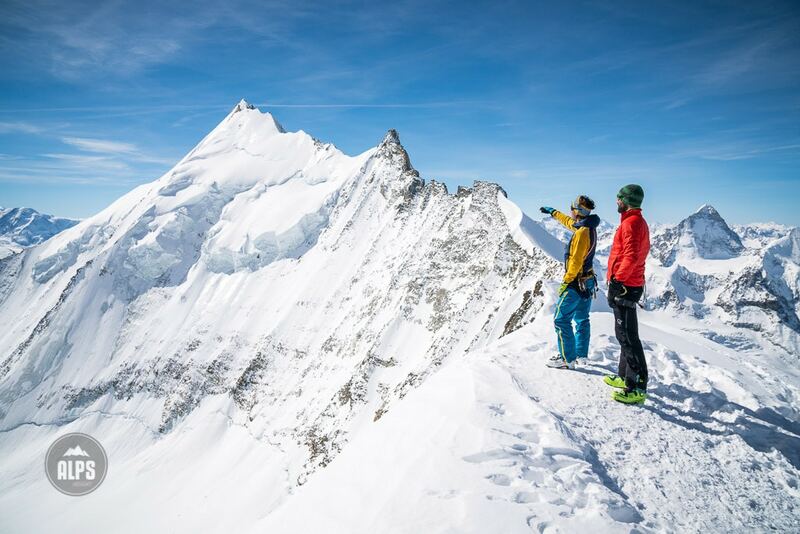 Skiing the Wallis Region's 4153 meter Bishorn offers a 2500 meter continuous descent from one of the Alps most scenic summits. But first, you have some work to do. No matter how you reach the Bishorn it is long, but, there are options. Via Turtmanntal. Depending on how far you can drive up the Turtmanntal, you can reach the Turtmann Hut, or continue on to the Tracuit Hut, for the first night. However, this option has a common 10km+ flattish approach required. Via Turtmann Hut. Starting lower in the Val d'Anniviers, from St. Luc, skin or ride lifts to the Bella Tola and ski into the Turtmanntal via the Pas du Boeuf. This descent puts you near the end of the Turtmanntal where an easy 600 meter skin reaches the hut. Again, overnight at the Turtmann Hut, or continue on to the Tracuit (long, 3-4 hours, about 1000 meters). Via Zinal. Skin straight up to the Tracuit Hut from the valley. This option is the shortest, most direct way to the Tracuit but should be done early to insure being off the west facing hillside in the afternoon heat. Also, reaching the snow line can be problematic on ascent if it is a lean year, check conditions. In our Stories section, there is a Bishorn Trip Report that details our experience in March 2017. 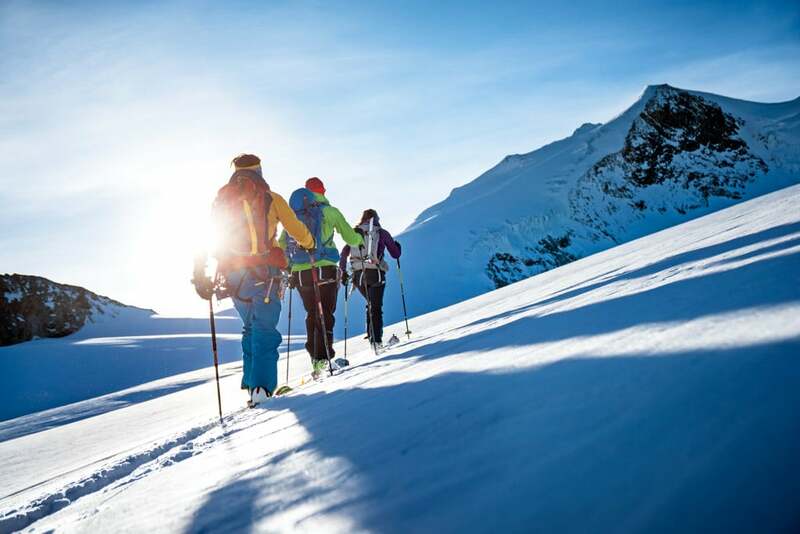 Basically, this tour is easy, and classic, ski touring, with few objective hazards. The glaciers, if well covered, have few crevasses or serac issues. The upper glacier does have some crevasses to watch out for, but being so high often remain well filled in. If you have good weather, route finding is relatively easy, however as is the case for any glacier travel, if the visibility drops the situation can get serious very quickly. If you don't have glacier skills, or a navigation plan, go with a mountain guide. One notable issue is the route finding from the Turtmann Hut. If you start your climb of the Bishorn from the Turtmann Hut, be sure to know the route to the glacier as it will likely be done in the dark. A lengthy detour is made east to reach the Brunnegggletscher's plateau from which you'll ski down to access the Turtmanngletscher. Familiarize yourself the night before. It is not difficult, only a bit surprising in terms of distance east. 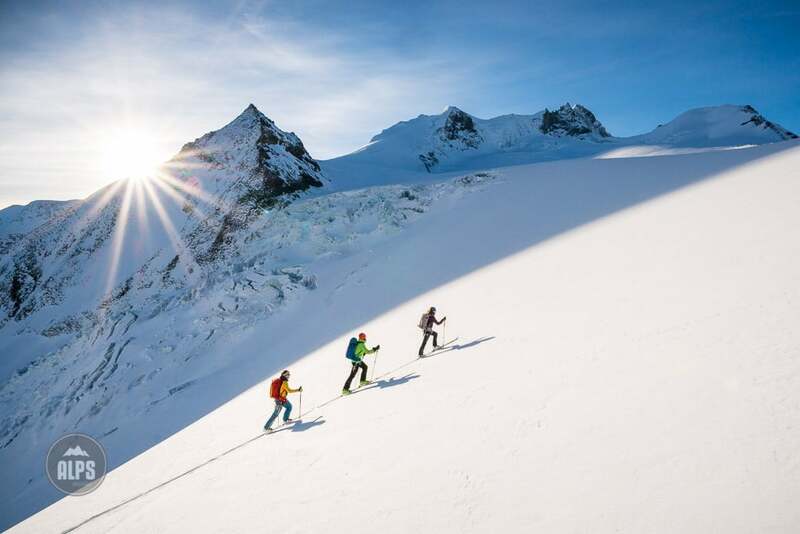 Once on the Turtmanngletscher, it is little more than a very long march to the summit where a 30 meter boot pack (crampons may be necessary depending on conditions) awaits to gain the true summit. On the upper glacier, pay attention for crevasses, for the up and down. The descent, given the right spring conditions, should be packed powder until the Tracuit Hut, then a massive corn harvest all the way to the valley. But, reaching the valley without taking off the skis is only going to happen after a big snow year. The descent trends south where it keeps to skiable terrain, although snow quantity will dictate how much time you have to walk through brush. Eventually you'll reach the valley where the descent from the Blanc de Moming and Cabane Arpitetta also finish. From here, it is a 4km slight descent into Zinal. It should be noted that the descent includes what I consider some of the most dramatic views in the Alps. At times, looking up to the north side of the Zinalrothorn, the west face of the Weisshorn, and the east face of the Dent Blanche, things will feel more like the Himalaya than the Alps. Finally, once in Zinal, consider an overnight, or at the very least a dinner, at the Hotel Le Besso. This is one of our favorite hotels in all of Switzerland. The food is superb, the beer made in house, and the hotel super comfy and fun. TIP: To reap the rewards of your massive effort of both uphill and distance, go when conditions are good. The start from St. Luc with a finish in Zinal is a classic mountain tour through all kinds of terrain. If you don't stay at the Tracuit Hut, be sure to at least stop in for a drink, it's stunning. 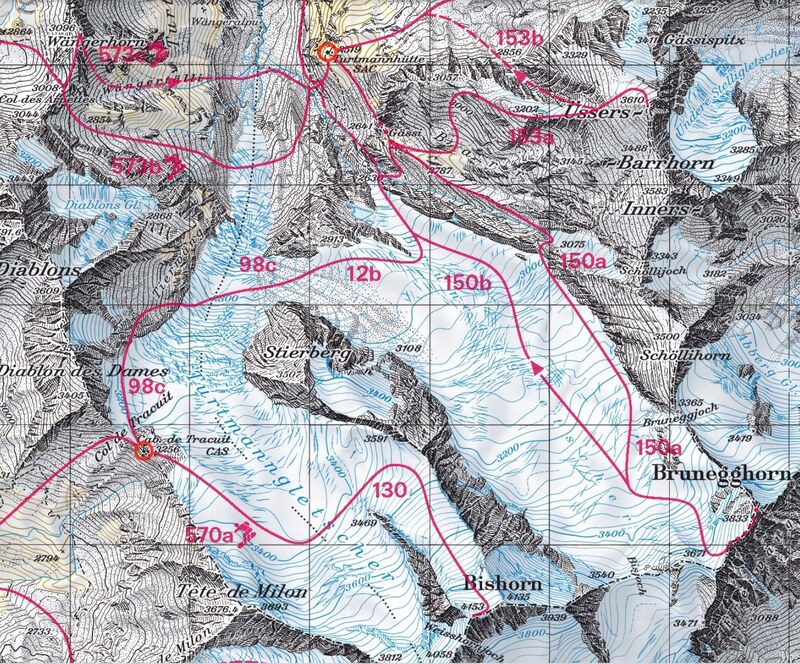 MAP: Skiing the Bishorn from either the Turtmann or Tracuit Huts is going to require significant time on big glaciers. A solid understanding of glacier travel and crevasse rescue is mandatory. On the Turtmanngletscher, the summit of the Bishorn is top center. The Bishorn summit view is dominated by the massive northeast face of the Weisshorn. Also, in the distance right is the Dent Blanche.